This article is about the novel. For the album by James Blackshaw, see The Glass Bead Game (album). For the album Glass Bead Games by Clifford Jordan, see Glass Bead Games. "Glasperlenspiel" redirects here. For the German electropop duo, see Glasperlenspiel (duo). "Glass Bead Game" is a literal translation of the German title, but the book has also been published under the title Magister Ludi, Latin for "Master of the Game", which is an honorific title awarded to the book's central character. "Magister Ludi" can also be seen as a pun: ludus is a Latin word meaning both "game" and "school". However, the title Magister Ludi is misleading, as it implies the book is a straightforward bildungsroman. In reality, the book touches on many different genres, and the bulk of the story is on one level a parody of the biography genre. The novel is an example of a bildungsroman, following the life of a distinguished member of the Castalian Order, Joseph Knecht, whose surname means "servant" (and is cognate with the English word knight). The plot chronicles Knecht's education as a youth, his decision to join the order, his mastery of the Game, and his advancement in the order's hierarchy to eventually become Magister Ludi, the executive officer of the Castalian Order's game administrators. The beginning of the novel introduces the Music Master, the resident of Castalia who recruits Knecht as a young student and who is to have the most long-lasting and profound effect on Knecht throughout his life. At one point, as the Music Master nears death in his home at Monteport, Knecht obliquely refers to the Master's "sainthood". As a student, another meaningful friendship develops with Plinio Designori, a student from a politically influential family, who is studying in Castalia as a guest. Knecht develops many of his personal views about what larger good Castalia can achieve through vigorous debates with Designori, who views Castalia as an "ivory tower" with little to no impact on the outside world. Although educated within Castalia, Knecht's path to "Magister Ludi" is atypical for the order, as he spends a significant portion of his time after graduation outside the boundaries of the province. His first such venture, to the Bamboo Grove, results in his learning Chinese and becoming something of a disciple to Elder Brother, a recluse who had given up living within Castalia. Next, as part of an assignment to foster goodwill between the order and the Catholic Church, Knecht is sent on several "missions" to the Benedictine monastery of Mariafels, where he befriends the historian Father Jacobus – a relationship which also has profound personal impact for Knecht. As the novel progresses, Knecht begins to question his loyalty to the order, gradually coming to doubt that the intellectually gifted have a right to withdraw from life's big problems. Knecht, too, comes to see Castalia as a kind of ivory tower, an ethereal and protected community, devoted to pure intellectual pursuits but oblivious to the problems posed by life outside its borders. This conclusion precipitates a personal crisis, and, according to his personal views regarding spiritual awakening, Knecht does the unthinkable: he resigns as Magister Ludi and asks to leave the order, ostensibly to become of value and service to the larger culture. The heads of the order deny his request to leave, but Knecht departs Castalia anyway, initially taking a job as a tutor to his childhood friend Designori's energetic and strong-willed son, Tito. Only a few days later, the story ends abruptly with Knecht drowning in a mountain lake while attempting to follow Tito on a swim for which Knecht was unfit. The three lives, together with that as Magister Ludi, oscillate between extroversion (rainmaker, Indian life – both get married) and introversion (father confessor, Magister Ludi) while developing the four basic psychic functions of analytical psychology: sensation (rainmaker), intuition (Indian life), feeling (father confessor), and thinking (Magister Ludi). 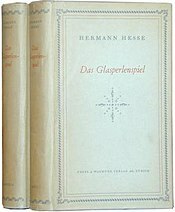 Originally, Hesse intended several different lives of the same person as he is reincarnated. Instead, he focused on a story set in the future and placed the three shorter stories, "authored" by Knecht in The Glass Bead Game, at the end of the novel. Two drafts of a fourth life were published in 1965, the second version being recast in the first person and breaking off earlier. Dated 1934, they describe Knecht's childhood and education as a Swabian theologian. This Knecht has been born some dozen years after the Treaty of Rijswijk in the time of Eberhard Ludwig, and in depicting the other characters Hesse draws heavily on actual biographies: Friedrich Christoph Oetinger, Johann Friedrich Rock, Johann Albrecht Bengel and Nicolaus Zinzendorf make up the cast of Pietist mentors. Knecht is heavily drawn to music however, both that of the acknowledged master Pachelbel and the more exotic Buxtehude. The fragment breaks off as the young contemporary of Bach happens upon an organ recital in Stuttgart. Joseph Knecht: The story's main character. He is the Magister Ludi for a majority of the book. The Music Master: Knecht's spiritual mentor who, when Knecht is a child, examines him for entrance into the elite schools of Castalia. Plinio Designori: Knecht's foil in the world outside. Father Jacobus: Benedictine monk and Joseph Knecht's antithesis in faith. Elder Brother: A former Castalian and student of various Chinese scripts & ideologies. Thomas van der Trave: Joseph Knecht's predecessor as Magister Ludi. Fritz Tegularius: A friend of Knecht's but a portent of what Castalians might become if they remain insular. The Glass Bead Game is "a kind of synthesis of human learning" in which themes, such as a musical phrase or a philosophical thought, are stated. As the Game progresses, associations between the themes become deeper and more varied. Although the Glass Bead Game is described lucidly, the rules and mechanics are not explained in detail. Many characters in the novel have names that are allusive word games. For example, Knecht's predecessor as Magister Ludi was Thomas van der Trave, a veiled reference to Thomas Mann, who was born in Lübeck, situated on the Trave River. Knecht's brilliant but unstable friend Fritz Tegularius is based on Friedrich Nietzsche, while Father Jacobus is based on the historian Jakob Burckhardt. The name of Carlo Ferromonte is an italianized version of the name of Hesse's nephew, Karl Isenberg, while the name of the Glass Bead Game's inventor, Bastian Perrot of Calw, was taken from Heinrich Perrot, who owned a machine shop where Hesse once worked after dropping out of school. The name of the pedagogic province in the story is taken from Greek legend of the nymph Castalia, who was transformed into an inspiration-granting fountain by the god Apollo. Freedman wrote in his biography of Hesse that the tensions caused by the rise of the Nazi Party in Germany directly contributed to the creation of the Glass Bead Game as a response to the oppressive times. "The educational province of Castalia, which provided a setting for the novel, came to resemble Hesse's childhood Swabia physically while assuming more and more the function of his adopted home, neutral Switzerland, which in turn embodied his own antidote to the crises of his time. It became the "island of love" or at least an island of the spirit." Freedman opined that in the Glass Bead Game "contemplation, the secrets of the Chinese I Ching and Western mathematics and music fashioned the perennial conflicts of his life into a unifying design." In 2010, The Glass Bead Game was dramatised by Lavinia Greenlaw for BBC Radio 4. It starred Derek Jacobi as the Biographer, Tom Ferguson as Knecht and David Seddon as Plinio. ^ "The Nobel Prize in Literature 1946 – Hermann Hesse: Award Ceremony Speech". The Nobel Foundation. Retrieved 2014-02-20. ^ Theodore Ziolkowski, Foreword to The Glass Bead Game, p. xix. Picador. ISBN 0-312-27849-7. Ziolkowski cites Thomas Mann's recognition of the source of the book's humor as "the parody of biography and the grave scholarly attitude." ^ Hesse, Hermann (1943). The Glass Bead Game. Owl Books. pp. 352–354. ISBN 0-8050-1246-X. ^ Hermann Hesse. The Glass Bead Game. Penguin. Hammondsworth 1975 p 416. ^ a b Ralph Freedman. Hermann Hesse. Pilgrim of Crisis. Jonathan Cape. London. 1979. p 348. ^ Ralph Freedman. Hermann Hesse. Pilgrim of Crisis. Jonathan Cape. London. 1979. p 350. The Glass Bead Game Paul Pilkington's implementation remains close to Hesse's original conception which grew from the connections between music and mathematics. A wiki exploring playable variants of the glass bead game and what an ideal glass bead game might be. The Glass Plate Game A playable variant invented by Adrian Wolfe and Dunbar Aitkens in 1976. Wooden cubes and small colored transparencies are used to map and record a conversation on a mosaic of "idea cards" as players find and discuss connections among ideas represented by the cards.